This diving helmet completes the flair of nautical theme. It looks like an original antique diving helmet. 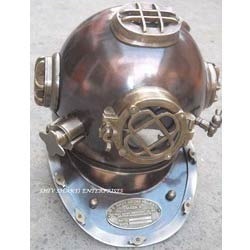 This full size 18" diving helmet makes beautiful your corner as a decorative piece. This helmet is made of brass & copper and weighs approx 11kg.